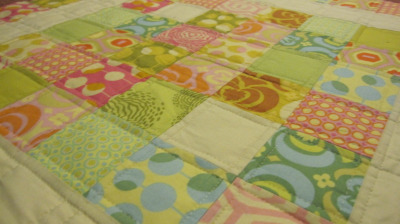 Here's one of my latest quilts I have been working on. 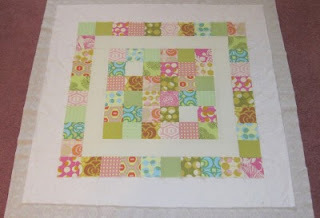 I just love Amy Butler fabrics right now, and her fabric was just the right choice for this simple quilt. I chose straight line quilting to accent the simplicity of the squares. The finished size ended up being 25" x 25", the perfect size for a table top. Sometimes small projects like these are great for motivation to finish even bigger projects. 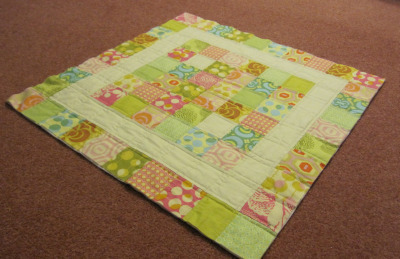 I am hoping to sew the binding on later this week, so more pictures to come!